Mike and Tania Marino both graduated from the University of Massachusetts in the early 1990's. Tania, in 1991 with a degree in economics and Mike, in 1992 with a degree in Arboriculture. Together they form a great team forming the backbone of Hailey Tree. Mike obtained a certification from the Massachusetts Arborist Association (M.A.A.) in 1998 and has collected a variety of other certifications throughout the years that are directly related to the tree care industry. 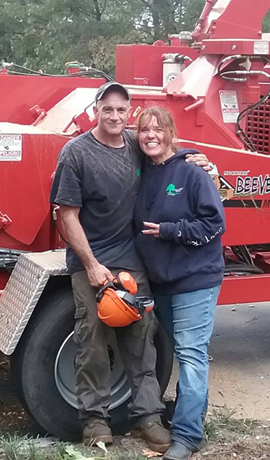 Throughout the years Mike has been performing all phase of tree care on a daily basis. To this day Mike and Tania continue to attend classes and seminars applying to their wealth and knowledge related to the industry. Hailey Tree was inspirationally named after Mike's only daughter.